Idles about and occasionally jumps and catches a fly. Players will need to use Ling-Ting's Favorite Tea in order to see the Golden Hoplings in the instance. This item can be purchased from Auntie Stormstout found near the entrance inside the Stormstout Brewery dungeon. The tea will create a drunk effect, however, players can click on buckets found within the instance to sober up. Doing this with a 110 toon solo is easy. However, there are bugs. The instance does not reset. It does not terminate properly. So, you MUST clear and search each room before going to a major boss change as doors close. And you cannot go back. Use a hearth-stone or mage portal to exit. Also, get five of the teas. And I went back to top-off. The script by SammyJoe for the Macro works great. I don't know if I'm just missing something obvious or if something has changed since these comments were left, but after you kill Hoptallus, the doorway you came though is closed and you can't go back that way, so you can't get back to the beginning once you clear the dungeon. I ended up resetting the instance and collecting as I went through. A L110 mage had no prob soloing and collecting as I went. Took about 30 minutes (5 teas) to get them all. I found the quickest and easiest way to see these once you've drunk the tea, s to stick name plates on with Shift+V, that and the macro posted I had pet and achievement in no time. That was easy. Ctrl+V worked like a charm. I also bought 2 of the special brews just in case my buzz wore off. Strong against undead pets, weak against critters. Its speed tends to be greater than its power. This pet is very easy to obtain. Speak to Auntie Stormstout at the entrance of the Stormstout Brewery entrance and buy her tea. When you drink the tea, you'll be able to see little gold hoplings hiding in the corners. I recommend that you pick up several in case your tea wears out. Quest is best performed when the instance is finished in order to avoid having the ads and bosses get in the way. • Reasoning: The additional 36 S, bringing it to 325, allows higher chance to att. first (granting a vital additional att. with this lower powered Humanoid) using Tongue Lash and Backflip. So, if you were in the uncomfortable position of being paired up against an undead opp, you will have a fighting chance. With a similar build as the Flayer Youngling, it can be particularly dangerous with a stun, root, and strong Crush attack. This 325 speed Hopling is probably the best one with this move set. Both Tongue Lash and Backflip both benefit from being fast. Tongue Lash can surprise opponents bringing undead to take your humanoid down. Crush is a nice hard hitter, but remember 80% hit rate. 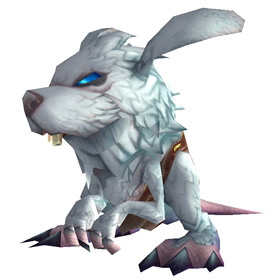 This is a quite powerful pet in PvP and very useful in certain PvE content. Poison Lash is of course strong against machines, and Stick Goo while not doing much damage can really hinder your opponent. Good pet. AND the Shift-V trick did it for me ! Thanks to EVERYONE for the helpful suggestions on how to get this guy. Now I need to level him! I have done this dungeon so many times and never knew about this pet!! I have LOTS of pets! (Just a winter season away/snowy owl from Zookeeper lol) I happened to see where someone suggested him in a particular fight... I IMMEDIATELY cued for Stormstout and got him! wooohoooo!!! ( I must say it was the middle of the night, time for bed but I NEEDED that pet! sp I came close to getting kicked from my group!! I was like...LOOK a butterfly, I mean Golden Hopling!!! what boss? ) can't wait to level her!! Solo'd this on my 90 Ret this afternoon. No real issues, tbh. The bosses aren't easy, exactly, being solo, but they aren't hard, either. Took about an hour from start to finish. ETA: Just wanted to mention that the targetting system can lead you astray. Often the Golden Hopling was a level above or below where you were. so just got this little dude, and was a bit shocked as to how easy he really is to get. did the run with a guild mate, brought the tea in the beggining, cleared all, then shift + V to see the name plates, ran and got all 30 of them and get the achive, and so did my guildie, so it seems if u are in the group with someone who dose it, you will get him too. a nice qucik way if you and some guildies are looking for him rather than one by one. clear the dungeon first and stick aroud. Drink the tea (you really only need 2 if you wait til the end). use shift + V this will make friendly name plates appear. Walk around and click them. Super easy. Got two level 90 hunters(including myself) and a level 90 warrior from the guild and ran this on normal mode. While they ran around and cleared I followed behind them and got the golden hoplings with the macro (which helped so much!). Because we did this as we cleared, I went through 8 bottles of the drink. But it was really easy to clear! It may also help if you have the glyph for your druid that allows you to track critters along with humanoids while in cat form. However, sometimes if there are too many hozen left it can be hard to pick out the Golden Hopling dots from the Hozen. Additionally, they will only appear as dots on the minimap unless you have drank the tea. Hope this helps! That macro was extremely handy. Note that it doesnt count how many you have found on ur achv bar, so its hard to gage how many you have gotten unless u count them. I got this pet to level 25, he's usually in my farming rotation. His speed is pretty nice, and most of the fights will take priority in speed. This works well for his quick stun, deals damage, stuns, and he gains life back from being humanoid. He has a 5 turn poison that I use sometimes as well just to assure you'll do damage that round (and thus healing). Also he does extra damage to dragonkin, which is handy in later levels and fighting harder bosses. This helped me out finding my 30th hopling. After 3 full searches through the dungeon after we had cleared it, I whipped the following macro thing out and found the last one cleverly hiding. Best to do this after you clear Stormstout Brewery. 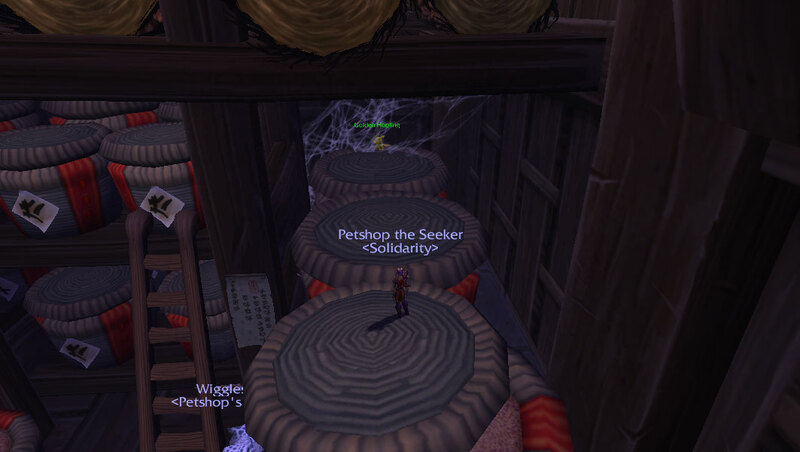 After the group leaves, go all the way back to the begining of the zone and look for a ghost npc named Auntie Stormstout and buy a few of Ling-Ting's Favorite Tea. Next, drink one. Then use shift-V to turn on name plates, search every corners and nook and click on the little golden bunnies. There are 30 total in the entire dungeon. Keep an eye on the buff, if the tea wears off you can't see the bunny so drink another. The great big world can be a dangerous place for such a tiny, adorable creature.